I have extremely important news. Last Wednesday, for the first time in three years, I caught up on all my podcasts. Yes, thank you, thank you, it’s an honor to be here. I’ll be taking questions now. Congratulations. How did you accomplish this? First of all, by making a conscious effort to plow through episodes over the weekend when I realized I was getting close. But perhaps more importantly, by mercilessly and judiciously honing my subscription feed over the last few months, unsubscribing and deleting and abandoning episodes halfway through if they weren’t holding my interest. I’ve been trying to cultivate a love of leaving things incomplete. Have you ever even come close to “inbox zero” before? Twice. It was very frustrating. Twice I’ve been within one episode of clearing my backlog, but before I could do it, a dozen podcasts updated simultaneously. It’s like trying to hold back an avalanche. On Being is always a keen, soulful look at what it means to be human. In this episode, host Krista Tippett interviews the poet Mary Oliver. I’m still mourning the loss of Starlee Kine’s Mystery Show, in which she solves small mysteries and has some startlingly endearing conversations along the way. Though I could probably just listen to this episode about a lost belt buckle ten times in a row and call it a season. An incredible blend of music and prose that captures dozens of quiet moments in the natural world. I don’t know that I’ve ever heard anything quite like it before. An interview with Craig Minowa, singer-songwriter in one of my favorite bands, Cloud Cult. Their perspective on life is expansive, and their live performances in this episode are haunting. A heartfelt and acerbic look at family and regret. I listened to this with my mom on a long car ride, and she laughed so hard she almost couldn’t drive. A sweeping look at injustices in the U.S. This two-parter gave me chills. What I love about Malcolm Gladwell’s podcast is how unapologetic he is in pointing out people’s inane beliefs and actions. It’s charming. Plus, this episode features a speech by the first female Prime Minister of Australia that sounds like it could have been pulled straight from West Wing. How does this achievement fit into your own personal narrative of media consumption that you’ve fabricated for yourself? What an oddly specific question! However, I like to think of my podcast listening as occurring in seasons. The first season was waaaaay back in 2006-ish when I listened to MuggleCast (a show about Harry Potter) religiously on my long drive to and from high school. Once the seventh book came out and the theorizing and analysis died down, I fell away from MuggleCast, and didn’t listen to much for the next ten years or so. There were a few “mini-seasons” in which I dabbled in RadioLab, Welcome to Night Vale, and Serial, but nothing too substantial blossomed out of this. Then, in the spring of 2015, everything changed with the beginning of season two, when my boss at the time introduced me to 99% Invisible. This launched my love affair with true earnestness. Since then there has always been a long and overwhelming feed of episodes piling up on my phone. So what can we expect as you continue into season three of your podcast experience? That’s not really up to me, is it? It’s up to the creators, the long flow of time, and the benefit of retrospect. Let’s follow up on this in 2022. I will say that things have gotten off to a great start with this fantastic conversation between Malcolm Gladwell and Adam Grant in a special episode of Revisionist History. They have thoughtful things to say on specificity, teams, and work life. One last thing: which episode finally cleared out your feed? 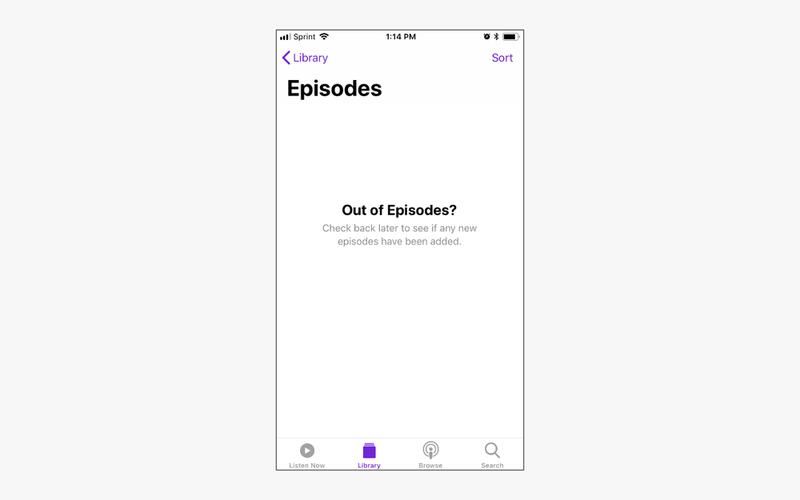 Appropriately, the last episode I listened to was an episode of 99% Invisible, the show that originally launched season two. So I guess you could say things have come full circle. Ah, the best kind of stories. They always somehow end where they began. And that’s all for this week! I’d like to thank Mystery Show, Welcome to Night Vale, RadioLab, Invisibilia, Hello from the Magic Tavern, Writing Excuses, NPR Politics, Unattended Consequences, and On Being for this great honor.